– Go to Tools->Cakewalk Plugin-in Manager, scan your plugins normally. Then, select the VST plugin you wish to use with jBridge, and in the Vst Configuration part click on “Plugin-in Properties” . Enable the option “Load using jBridge wrapper”. – No additional configuration is needed after jBridge’s installation, these hosts implement direct support for jBridge and will use it as needed. – No, all you need to do is install the new version over it and it’s all set. – This is a permission issue, make sure the folder has the necessary permissions and/or that you’re running an administrator account. – Some hosts will need a plugin rescan and restart. – You are accidentally including both the bridged files folder and the original plugins in the scan ( some hosts will ignore duplicate plugins ). – The plugin is not supported by the host ( ie, if you’re bridging a 32bit plugin, check if it’s detected by the 32bit version of that host ). – This can also be caused by permission issues. Make sure you are running an administrator account and / or that your auxhost’s are set to run with administrative privileges. – The plugin is not correctly installed. – The plugin uses a copy protection method incompatible with jBridge. – The plugin may not be compatible with you OS (ie, some older plugins won’t run in Windows Vista / 7 ). – You don’t have the necessary permissions ( are you running an admin acount? Do you have UAC on? ). – Some plugins can’t be run in more than one process at the same time . In jBridge versions equal or above 1.2, try enabling the “run in existing auxhost” option. In some cases, duplicating and renaming the plugin’s dll to a different name ( ie: plugin.dll ; plugin2.dll ; plugin3.dll ) can solve this problem. – This is another variation of a plugin which can’t be run on different processes at the same time. According to the reports, v5.4.1 of UAD’s drivers seems to worsen this problem even more. 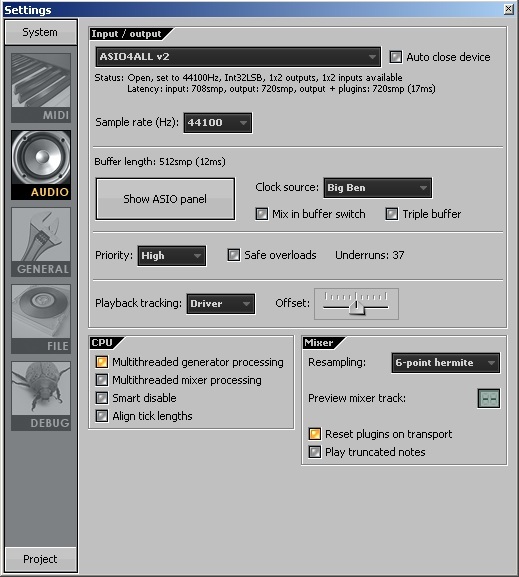 – For UAD2 plugins, try increasing the DSP Loadlock value. update( 18/03/2010 ): New reports say that v5.6 of UAD’s driver greatly improves the number of simultaneous “jbridged” UAD2 plugins. update( 29/03/2010 ): From jBridge version 1.2 onwards, try enabling the “Run in existing auxhost” option. – Click the jBridge icon on the bottom, it will issue a window refresh command. From v1.14 onwards, you can also try to enable the option “Force whole GUI refresh”. – If the GUI is still not displayed at all, try disabling UAC ( Windows Vista/7 ). – According to the reports, running the DAW as admin solves this problem. If you’re running the auxhost’s as admin, and not the DAW, you will get a white window. Please right click in the GUI’s window top and enable/disable the “Always on top” option. You might want to try the separated GUI mode instead. From version 1.18 onwards, enable the “switch to integrated GUI mode” option and reload your bridged plugin. – “Performance mode” may not work well with some plugins/hosts and the integrated GUI mode ( in fact, performance mode may not work at all with a specific plugin/host combination ), but you can try to set the plugin to use the separated GUI mode and see if it solves the problem. – Try enabling the “dirty close” option. – Try enabling the “prevent main host control when the GUI window is closed” option. – Try enabling the “I am getting a dispatcher opcode 19 error message” option. – Try the separate GUI mode. Please see issue nº 12 for details on how to switch to the separate GUI mode. 15 – “I can’t do drag n’drop in my bridged plugin”. According to the reports, disabling UAC solves this problem. Please update to the most recent version of jBridge. 1 – Disable all the bridged plugin’s options. If all the options were already disabled, try enabling the “use thread safety measures in auxhost” option. 2 – If the plugin still crashes, try to load it natively ( in the version of your host that matches the plugin’s architecture ) and see if the crash also occurs. If it does, it’s an issue with the plugin/host, if it doesn’t, you have probably encountered a problem in jBridge, please report the issue. Although I can’t offer (much) support for this, it was interesting to verify that DX/DXi plugins can be used in 64bit VST hosts by combining jBridge with Frank Potulski’s excellent mfx/dx/dxi wrapper dxshell. You’ll need to bridge the dll(s) created by the wrapper. – Make sure you haven’t changed your plugins location after preparing the bridging files. If their location has changed, you’ll need to re-create the bridging files. – update Cubases’s plugin cache. if the problem persists, try renaming the created .32.dll/64.dll/.32.txt/64.txt files to .dll/.txt and update Cubase’s plugin cache again. 20 – “Will jBridge cause any sound quality loss”? – No. It just transfers the audio data, doesn’t change it in any way. 21 – “Will my 64bit bridged plugin still be able to use all the RAM when I bridge it to a 32bit main host”? – Yes. It will still be running in its own 64bit auxhost, so no memory limitations apply as well. 22 – “How do I bridge Waves plugins”? jBridge versions equal or above 1.2 support shell plugins bridging ( if your main host also supports them ). – You’re creating bridging files using source files that are located inside the installation directory for your Waves product ( That is, if you need to bridge a WaveShell, bridge the one that is inside the Waves installation folder and not the one that is inside your VST plugin folder ). – Bridge the individual plugins located inside your Waves installation folder instead of their WaveShell ( They’re invoked by their WaveShell ). – No, this is not possible. jBridge can only use the RAM your OS can provide, therefore, a 64bit operating system is strongly recommended. – Try updating to jBridge v1.4 or above ( in v1.4 improvements were made, which, according to the reports, solved this problem with some plugins ). If the problem remains in your case, please contact me. – Try disabling any CPU throttling mechanisms in the BIOS such as Intel SpeedStep ( or EIST ) / AMD Cool n’quiet. According to the reports, this may improve performance in some DAW’s. UPDATE: It has been reported that the “use fixed buffer size” setting in newer versions of FL Studio works better with jBridge. – Try loading an empty project in your DAW, then, loading only one instance of each plugin at a time, enable the “run in existing auxhost” option for all of them ( load one, enable the option, unload, load next, etc ).